When you think of bachelorette parties you automatically expect the cliche or stereotypical atmosphere that you see in the movies. They almost always include lots of drinking, strippers, and naughty shaped objects. The era to alternative bachelorette parties is here and maids are doing their best to create a one of a kind experience for their bride-to-be. At Bridal Party Tees, we know all to much the desire to be trendsetters in the bridal industry and that is why we want to provide bachelorette party designs that you will not see anywhere else. 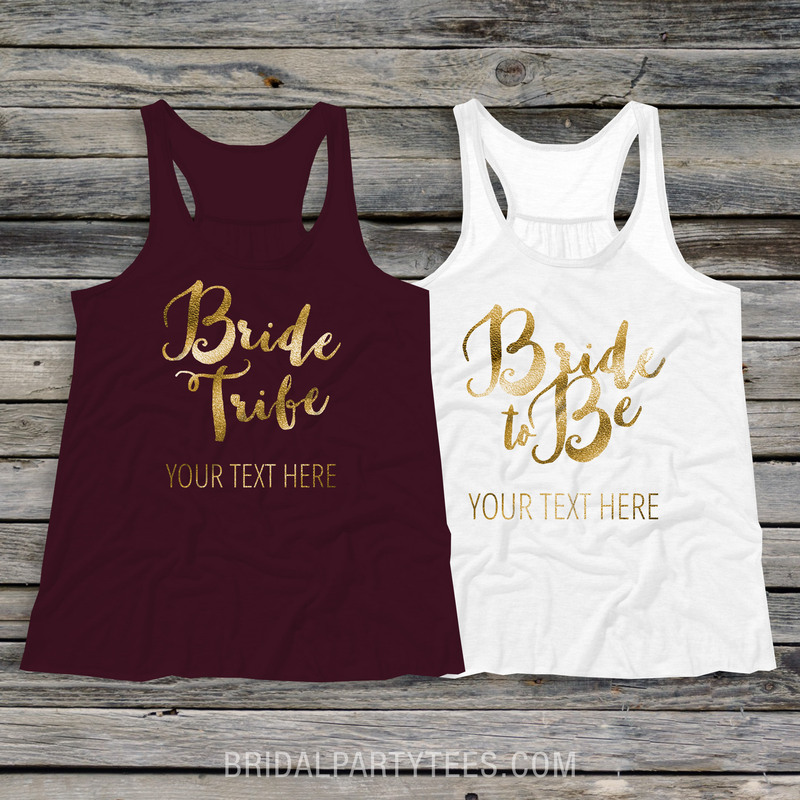 One of our newest and most favorite design concepts that we’ve added is custom Bride Tribe shirts! At Bridal Party Tees, we are passionate about fun, fresh, and trendy designs. 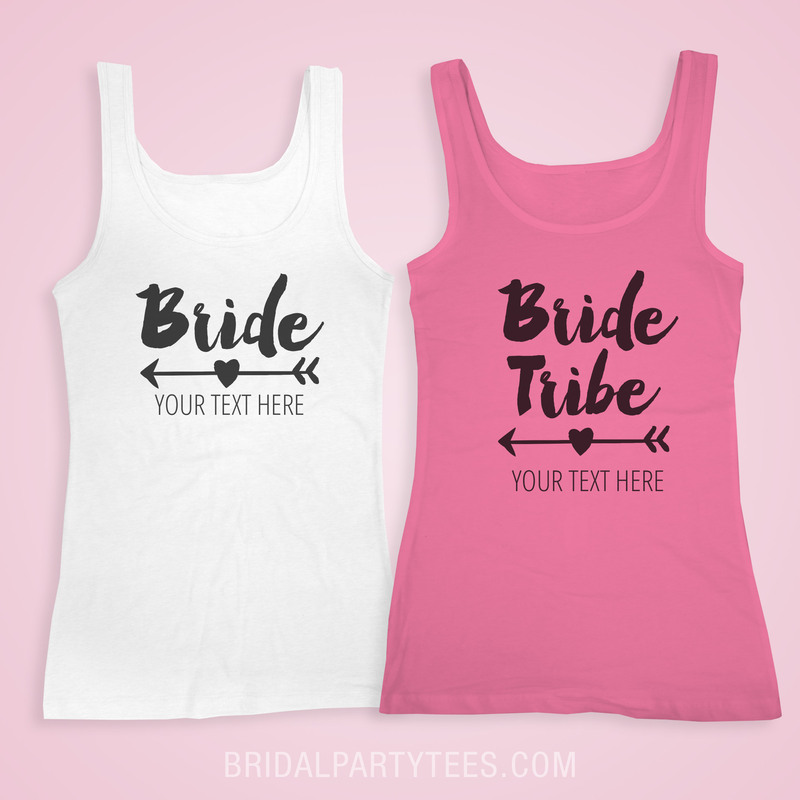 Our Bride Tribe shirts give our customers a cute and whimsical take on the ordinary bachelorette party. Designs include airy feathers, hand sketched arrows and text on flowy, lightweight tops but it gets better! All of our designs are printed on high-quality, super comfy tanks, tees and sweatshirts with the option for customization. Add your maid’s name, dates, and even the destination city where your bash is being held. Maybe the bride tribe theme isn’t exactly what you are looking for. 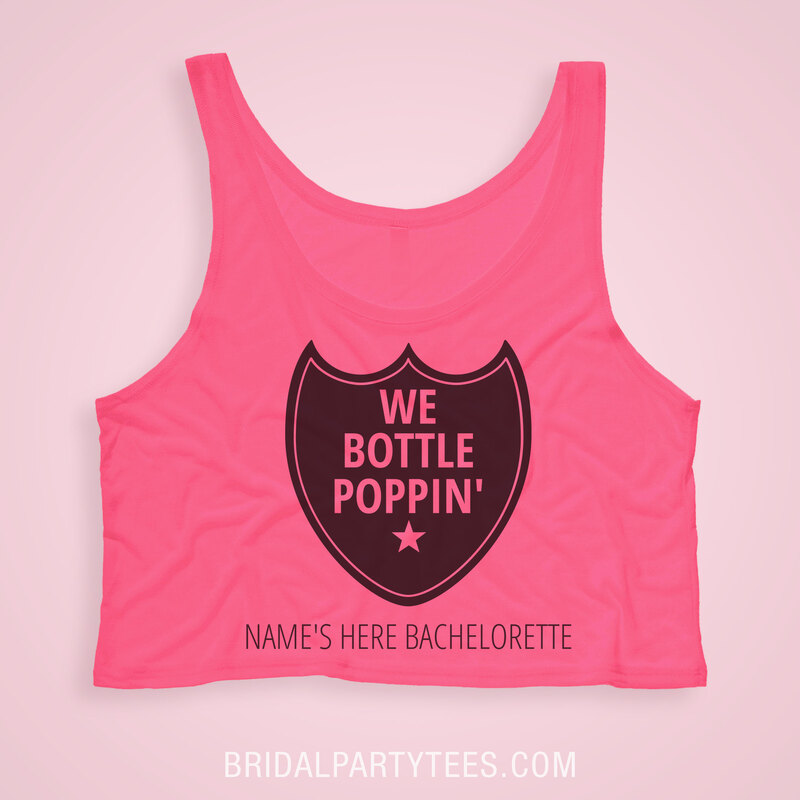 Bridal Party Tees offers thousands of bachelorette party shirts that will fit any and every theme you can image. Better yet, be the ultimate trendsetter by opening up your own custom bridal apparel storefront! Create your own designs from scratch and earn money for it. Have questions or need some assistance? Bridal Party Tees wants every storefront to achieve the design aesthetic they are looking for and are more than willing to help you get to that level you want to reach. We will help you with art assistance, design concepts, and anything else you can think of. Reach out to us at storefronts@bridalpartyees.com! Once your significant other has popped the question and the engagement party is over it is is time to get down to business. There is endless amounts of planning and intricate details that need to be done within a specific amount of time. Dresses, venues, food, and everything in between – planning a wedding can be incredibly overwhelming and time consuming. Trying to do it all on your own is stressful and hiring a wedding planner is just not realistic for the every day bride. That is where the one and only Maid of Honor makes her debut. Selecting your maid of honor is crucial and can be one of if not the most difficult decisions you will make for your wedding day. There are a lot of responsibilities that are tied into being the bride’s right hand woman and as your biggest supporter and the leader of your bridal party, your maid deserves a gift that feels distinctly ‘her.’ Make your bestie feel as significant and as important as she truly is with a custom maid of honor shirt! Finding unique and thoughtful maid of honor gifts for your partner in crime is an important part of the wedding planning process. Your Maid of Honor has been there for you through the years and you have shared numerous unforgettable memories together. 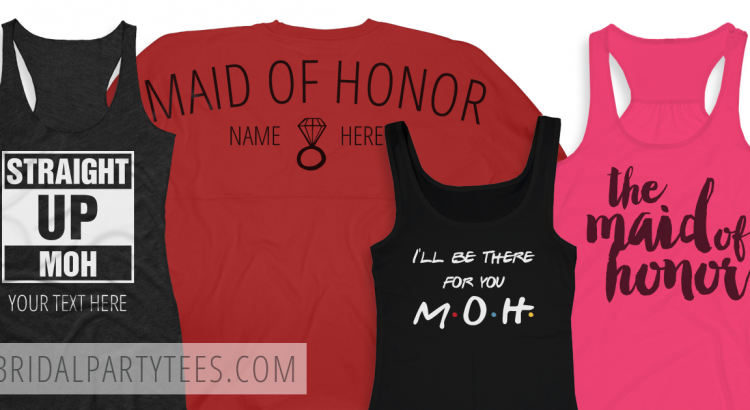 To show your appreciation, give her a creative and one of a kind gift such as a custom maid of honor shirt. 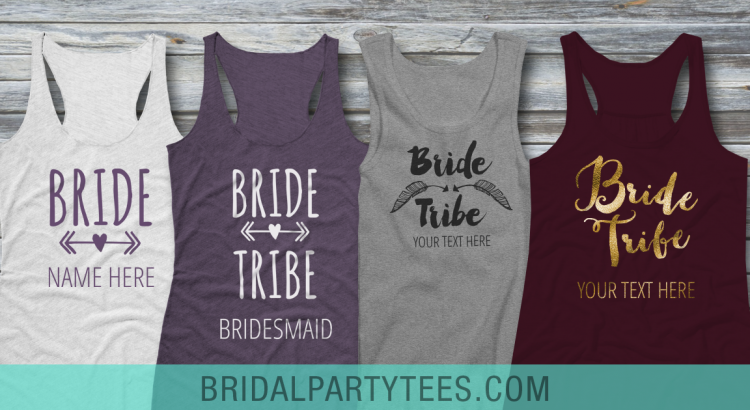 Bridal Party Tees offers a variety of styles that will surely fit your maid’s personality as well a gallery full of simple and classic designs to choose from. But make her feel even more special by customizing any design that we offer by adding nicknames, inside jokes, or your own saying or slogan that has special meaning and reflects the special feelings you have for one another. Your bridesmaids and maid of honor are some of the most important people in your life so let them know that you honored that they are participating in your big day with custom bridesmaids shirts! The majority of bridal parties hit the road when it comes to their bachelorettte party destination and when it comes to your last night out as a single lady you always want to go big or go home. Many bride-to-be’s and wild bachelorette’s make the journey to Las Vegas, Nevada because it offers something do for everyone in your party – shows, night clubs, spas, and the yummiest of foods. This city can deliver the perfect experience and the most unforgettable memories. 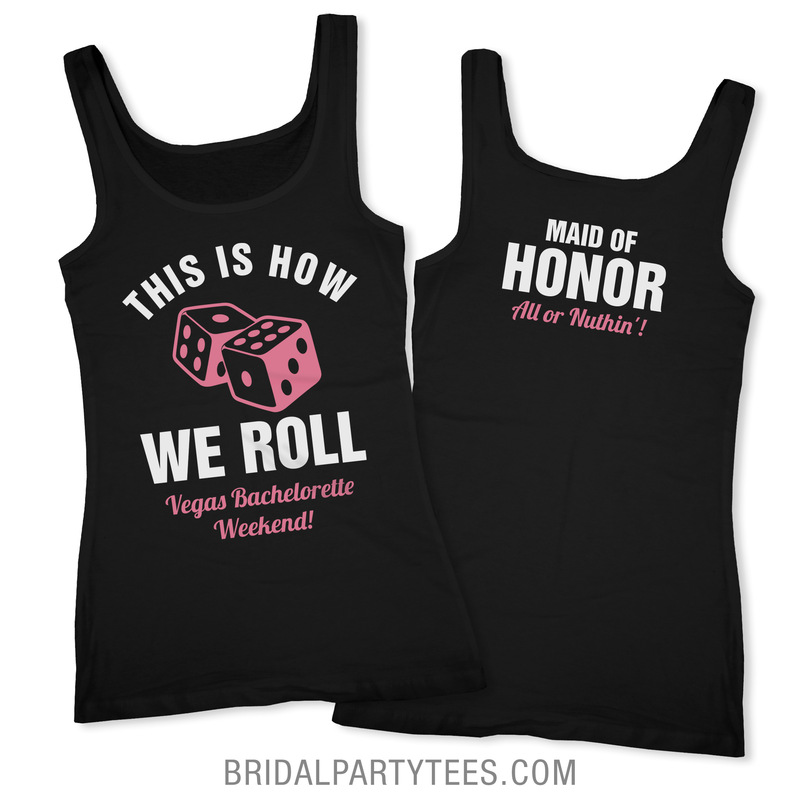 Bridal Party Tees wants to make your experience even better with vegas bachelorette party shirts! What we love best about Las Vegas is the versatility and ability to dress up your custom bachelorette shirt. There are so many activities to indulge in when visiting the sinful city so we made sure to fill our gallery with a variety of designs that will fit any bridal parties personalities. What’s best about our designs is that they pair incredibly well with jeans, classic black tights, and even a glitzy skirt. Our newest addition of metallic font and art will surely make you shine bright like the diamond while walking the Vegas strip. Batter up! Shop all of our cute and amazing baseball Bachelorette Party shirts. Use coupon code below to save! Use coupon code A16BPT at checkout and get $5.00 off orders of $40.00! Offer expires 4/30/2016 at 11:59PM EST.